Spartan tattoo designs are based on an ancient Greek society who were renowned for their fierce warriors and formidable army. Spartans also valued knowledge, took education seriously and even had a democratic government. They were the most feared military army in the Greek world between the 4th and 6th century. This society was once again commemorated in the 2006 movie 300, which told the legendary story of the Battle of Thermopylae. At this battle, the Spartans were remembered not for being victorious, but rather for being brave and having incredible resolve. Men and women loved the story of these “never say die” warriors and soon more and more people were getting Spartan tattoo designs. 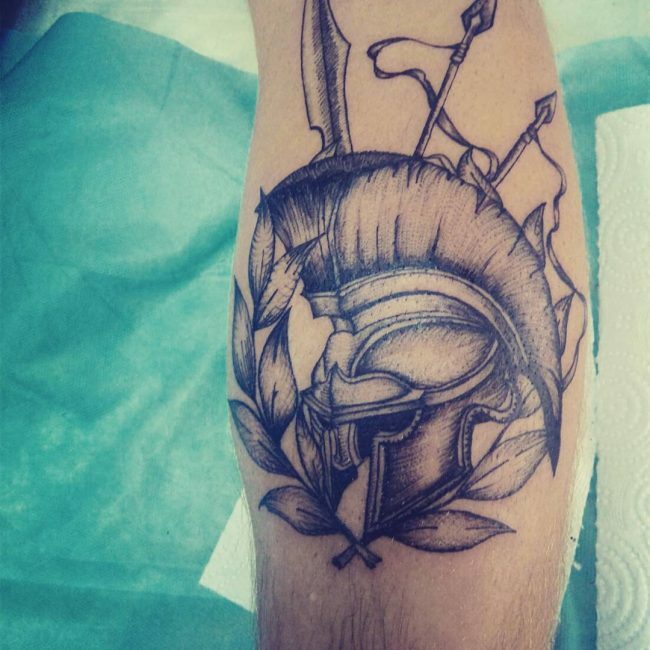 Since then these designs have grown in popularity with many people admiring the traits of the Spartans; bravery, courage, discipline and intelligence, and choosing to include Spartan warriors and equipment in their tattoo designs. These tattoos include a wide range of designs and here are some of the meanings associated with them. As you will see they speak to the individual’s approach to life, those around them and their beliefs. Spartans had a reputation for being honorable men who would lay down their lives to protect their society, way of life and their fellow warrior. In today’s modern world honor is hard to come by, so many choose a tattoo like this to remind them that the right thing to do and the hardest thing to do are often the same and they need to make honorable choices. Even when they were outnumbered and facing almost certain defeat the Spartans never gave up. They embodied bravery and even today people still admire their resolve and want to remember that if the Spartans could face such terrible circumstances and still stand firm that they can overcome life’s obstacles as well. 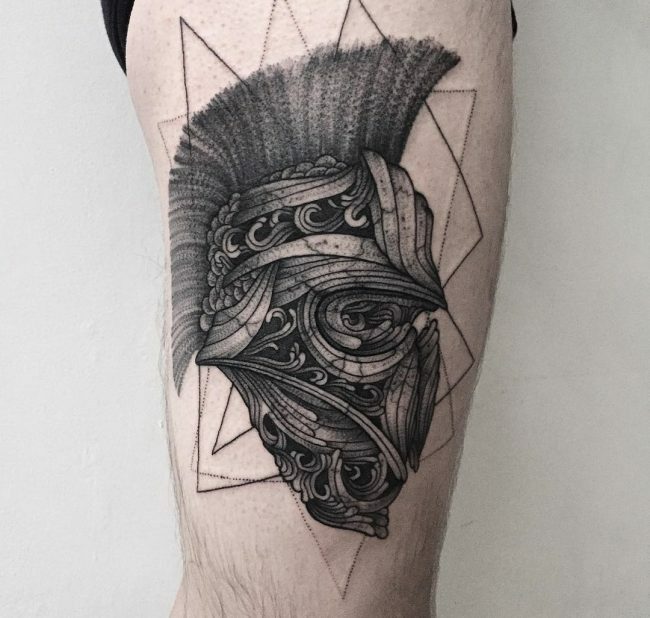 Many people who choose a tattoo of a Spartan have been in battle; either psychically or emotionally and they may choose a shield or warrior design to signify their triumph (and return) from combat. This Greek society had a powerful reputation and a strict code of honor. Spartan images make meaningful tattoos for those who feel powerless and need a reminder of their inner strength and resolve. There are men (and some women too) that see themselves as protectors or defenders of their families, communities, and countries and will get a Spartan style tattoo to remind them of their role and responsibility. After serving their countrymen (and again some women) wish to preserve their memories and showcase their dedication to their country and their beliefs. They may choose to immortalize this in a tattoo that represents their patriotism. Shields are quite popular for this type of tattoo and they may choose to include their countries flag or their unit numbers in the design. From a young age, Spartans learned about discipline and that is why they were able to grow such a strong and powerful army. Today discipline seems to be lacking in our world and getting this kind of tattoo may represent an individual’s brunt self-discipline and pride. Spartan boys were raised firstly as warriors, everything else was secondary to that role. They had a strict code of honor which punished recklessness and cowardice harshly and they were feared throughout the Greek world for their military prowess. Those who chose a Spartan warrior tattoo may choose a bust ( a soldier from the head up with a helmet) or full body design. Tattoos with just a helmet or with a Spartan on the back of a horse are also popular. The shield was one of the Spartans most important military tools which they used to advance and fight their enemies with as a unit and not only to prevent an individual attack. This technique, which was immortalized in the movie 300, showed how the Greeks stood together. Shield designs may take on many different forms such as Celtic swords, swords, and spears, outlines and swords with script, crests or coats of arms. The spear or Dory was the main weapon used by these Greek warriors. A sought after design is two crossed spears with a helmet above. The spear shows the person’s willingness to defend themselves, their fellow man and their families. Words such as warrior, freedom, courage, determination, never give up and the Greek text Molon Labe (which means “Come and take them” – a slogan of their defiance) are all common words that are sometimes included in these designs. 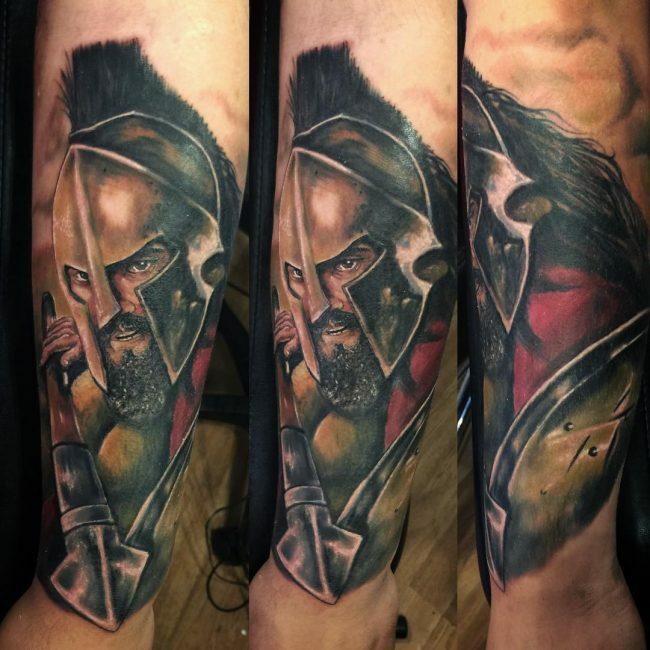 While some people may choose colorful Spartan tattoo designs, they look best in bold black, sometimes with gold, red (for the tufts or the helmets or background) or silver ink (used to define weapons). 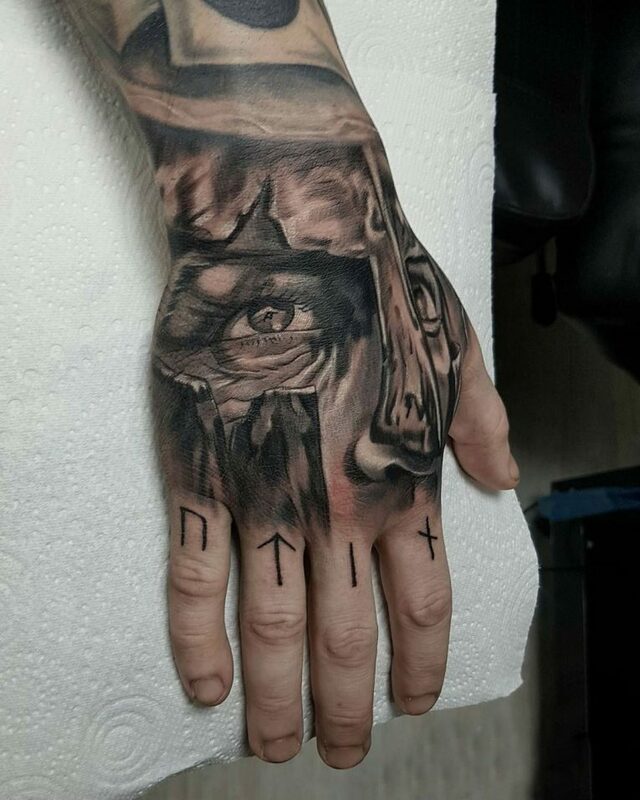 There are also artists who specialize in hyper-realistic designs and Spartan warriors and battle scenes can look outstanding when inked in high detail. 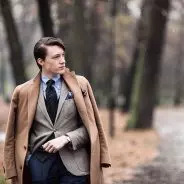 While these types of tattoos generally look best on a larger scale (on the back, chest, or shoulders) there are a few smaller designs that look meaningful. These may include a small helmet outline or wing which can be inked on the hand, wrist, foot or stomach. 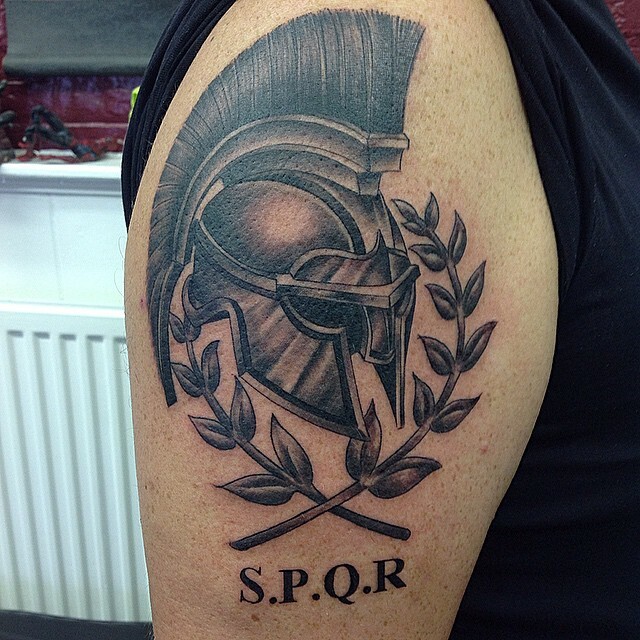 Spartan symbols are also widely used in sleeve designs and full back tattoos. Tattoos of a Spartan have masculine undertones because it was the men who were warriors, however Spartan women were also tough. While these types of tattoos and images may be more sought after by men, there are also women who choose to have them as they feel they relate to the ideals of that society. The Spartans were a nation with much to admire. They were strong, powerful, disciplined and relentless. Warriors weren’t afraid to stand up for what they believed in and were even willing to die to defend these ideals. They did not tolerate weakness or stood firmly together. It’s no wonder that people today choose to remember their courage and determination and use Spartan tattoo designs to signify their desire to be like these warriors.